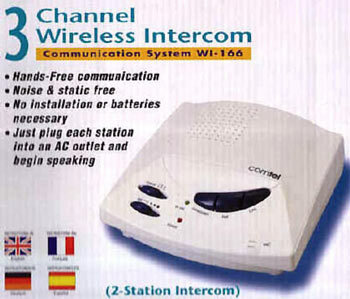 This wireless communication system uses your home or business own electrical wiring. It does not require radio waves or any other "traditional"method of wireless technology. Since the intercom uses wire rather than radio waves, you are no longer limited by distance or "thick walls" This units should be able to work on totally opposite ends of your home or your office, even on difference floor. 1. In some large offices or warehouses, three phase transformers are used in the electrical system. In such cases, This wireless communication between different phrases may not be possible.If you encounter this problem , try alternate electrical outlet. 2. The intercoms work on pre-set stations. In order to speak and listern between stations, you must make sure that each station is set to the same station number. Check the "CHANNEL SELECTOR" switch. Baby monitoring, warehouses, offices, shops, restaurants, lift and elevators, factories, showrooms, production lines. and even exhibition centres. Original S$ 380.00 Promotion $ 320.00 To purchase e-mail sales@secureciti.com.